This is not as much a creative effort as a logical combination of two of ID10-T's excellent ideas--the macaron base from Mango Blossom Macaron, and the blueberry flavor from Viserion. 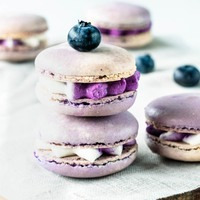 It's amazing how well these two elements work together, and as a blueberry lover this is already hands-down my favorite macaron recipe. FW Blueberry and TPA Blueberry Extra provide a sweet, bright blueberry flavor shamelessly lifted from another of id10-t's best recipes, Viserion (at his suggestion). The dash of Lemon Sicily makes the berries pop. Feel free to substitute INW Lemon Mix or another tart lemon flavor. Quoting id10-t for the parts of his recipe that I'm re-using for this blueberry variant. "FA Almond 2%, FA Meringue 2%, CAP Sugar Cookie 2% - Simple and to the point, this is a macaron, a sweet meringue drop cookie made with egg whites, icing sugar, and ground almond. They're often infused with flavors and color, and made into a light, delicate cookie sandwich with a cream filling that might or might not also be flavored and colored. FA Almond gives a clear, clean almond flavor and FA Meringue has both the airy baked egg white and powered sugar thing going on. CAP Sugar Cookie stays sweet, texturizes (makes whole almonds ground), and further bakes these goodies. When I think about what a macaron tastes like, these three concentrates together just seem insanely obvious. AP-laden bakery ingredients are just too heavy for such light and airy cookies. Try this simple 2/2/2 macaron base with your preferred macaron flavors, but take care not to do so with a heavy hand. These treats are delicate and the flavoring should be subtle yet ingratiating. FLV Cream 1% - There's your cream filling. This stuff is my Frank's Red Hot lately. If you have to sub something, try 1.5 to 2% CAP Vanilla Whipped Cream, which will shorten the steep time, or TFA Whipped Cream 2%, which will stretch it to two weeks. Neither of those will be quite the same, but should still be tasty." Version 1: used the blueberry trifecta, but the bilberry wasn't working for me. Version 2: Less bilberry, more FW blueberry. I think it's going in the right direction, but it's not far enough, I think. Version 3 (this): I decide to try the base with another very successful blueberry profile, the one used in Viserion. Even as a shake and vape, I can tell this is a bingo! I'm still testing some variations, because there's no such thing as TOO delicious, but this is now the addictively sweet, delicate blueberry jam delicacy I was hoping for. This recipe is the property of beeker and released under the All The Flavors Public Domain license. You may not copy, derive or commercialize this recipe without following the terms of this license or the explicit permission of the creator.